We implemented 1:1 computing programs in 30 schools. Here’s a good estimate of the phases. Be AwareIf you are starting from scratch, reinventing the wheel, or operating without an experienced consultant – your planning cycle will take much longer. A consultant will pay for themselves. Don’t “go it alone”! If you haven’t done program deployments before, you will make a slew of mistakes. There are just so many decision points in the process, that there’s no way you can get them all correct the first time through. If you need help, please contact Digital Wish. 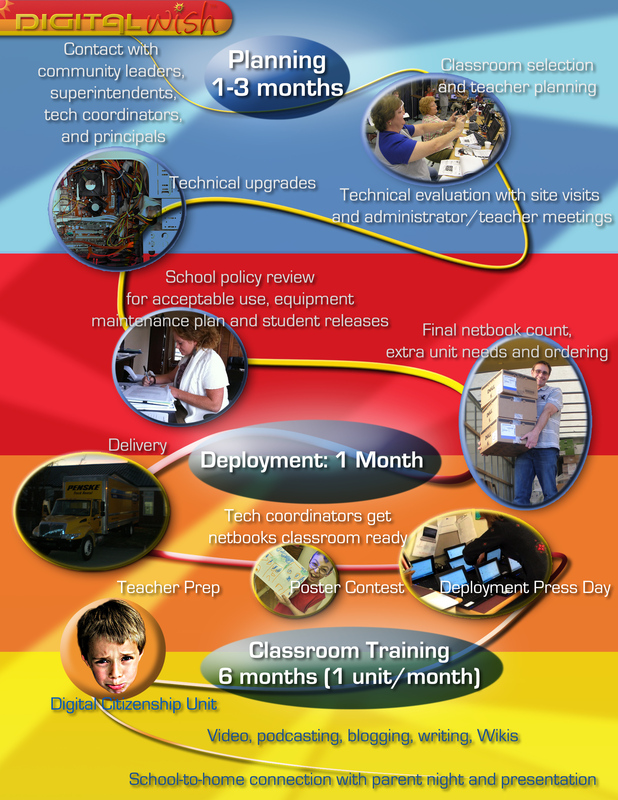 On staff, we have some of the most experienced experts in the country for deploying 1:1 programs. Call us at 802-375-6721 ext. 222 and talk to Gordon Woodrow if you want to book a consultant. Email Gordon at gordon@digitalwish.org We’re a non-profit, so we’re on your side!